Finland leads the world in early childhood education! 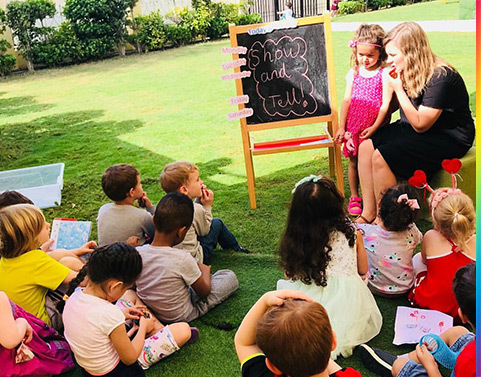 Teachers use a guided learning approach taking into account children’s individual interests and abilities, guiding them during play through goals across subjects. Kipinä has an “Intentional Play-Based” approach. Where learning through play is the guiding principle in Finland, Kipinä brings more structure to the play to ensure children gain the literacy and numeracy skills they will need in the regular school system. Kipinä follows a balanced child-centered and teacher-directed framework. Using guided learning and skilful instruction similar to the core philosophy of the Finland program, Kipinä has added the teaching methodology of focused instruction. The task of instruction is to promote children’s learning and to help the children understand themselves, other people and the surrounding world. It supports and utilises children’s natural curiosity and desire to experiment. The instruction takes into account children’s developing skills, interests and strengths as well as their needs for individual support. In addition, the instruction is based on the objectives set for learning environments, transversal competences and pedagogical activity. Focused instruction accelerates the learning process, so children learn at a faster pace. Research shows it brings more value to both the learning and teaching process. Teachers must observe and document the children’s play. Observation of play increases the teacher’s understanding of children’s thoughts and interests as well as their emotions and experiences. These observations are used in planning and guiding play and other activities. Our teachers use a time-saving app to track children’s academic progress, daily activities, skillset development, and to communicate with parents, giving them more time to focus on teaching instead of administration. Kipinä is looking to secure a master franchisee in the UK. Finland is known for its excellent education system and at Kipina, we can provide a fully-up-to-date, globalised Finnish curriculum, ready for use in the UK. We will provide carefully documented Policy and Procedures documents, Staff Handbooks, Emergency Plans, and an Operations Manual that's so comprehensive you'll by running the best nursery in town. What's included in a franchise? Guidance & Support from Academic Director???? We have identified development regions across the UK, and would like to award Regional Master Franchises to suitably qualified individuals or companies. Please complete the enquiry form below and we will be pleased to provide more information on the Master Franchise investment.